Does that picture scream George Costanza or what? Sorry, I digress, but you know you thought of Seinfeld – at least you should have if you didn’t. Alright, with Valentine’s Day behind us and dating season in full swing as we head into warmer months, it’s time to roll out our official 2017 Online Dating Price Guide for Gamers. Wait, what? We’re actually going to advertise other online dating sites? Yep, because let’s be frank: online dating still sadly costs a fortune, and we believe you should spend your money on more important things: like your date, for one! So without further adieu, let’s get this online dating price guide underway and see what the big box dating sites are offering for 2017. If I choose their 6 month “special offer” plan I’ll end paying $209.76. If I elect to go longer with the listed 12 month plan to save on a monthly basis I’ll end up shelling out a whopping $323.40. Again, we all know the site and the pool of matches is astronomically big, but why not at least offer a one month option? What if you live out in the rural areas, and you don’t find a quality connection in your first six or twelve month subscription? It’s kind of crazy to think about, but we all know folks are paying those prices – the site wouldn’t be in business if they weren’t. Alright, let’s move on to the biggest one of all, Match.com. Alright Match.com – let’s see how you compare to eHarmony. Well the first thing I notice is that Match does offer at least a 3 month subscription where we all know from eHarmony’s subscription screenshot above the lowest they’ll go is six. 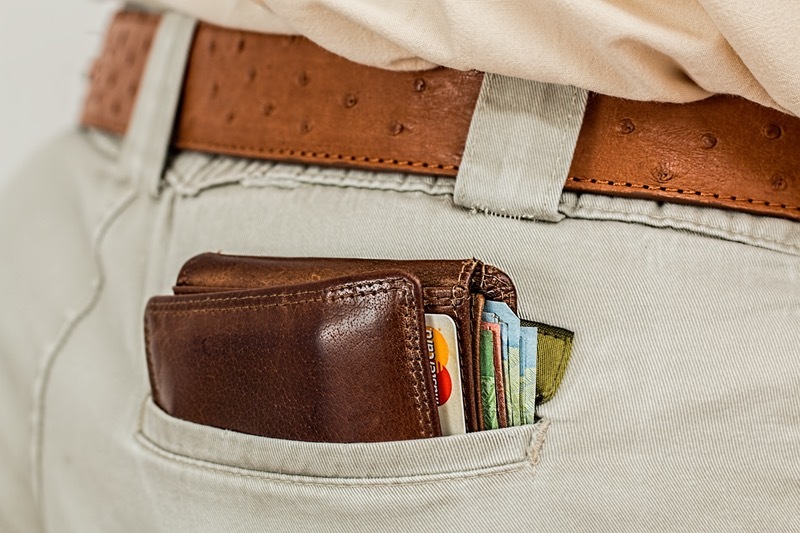 The savings percentages in orange are certainly eye catching, but we all know – at least those of us like George Constanza – we all pull out our calculators or do some quick mental math to see what the true cost is. Okay, so if we start at the 3 month subscription we’d have to throw down $68.97. For Match’s 12 month or one-year subscription the total up front cost hits $197.88. 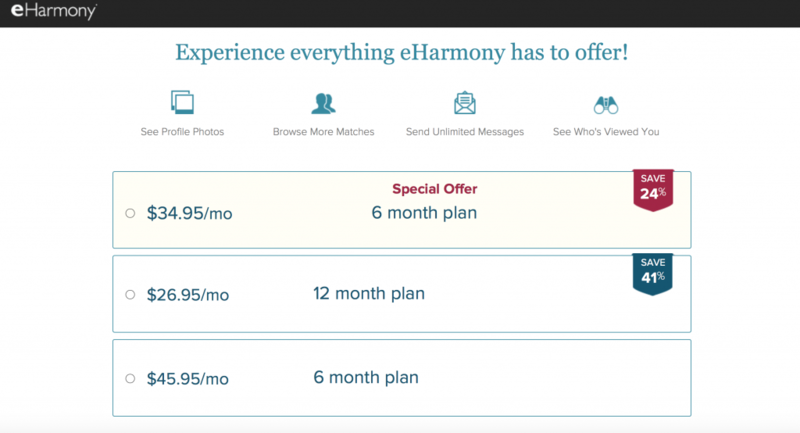 Probably the biggest takeaway when you compare eHarmony and Match is at the six month level: eHarmony’s six month total cost is ridiculously higher than Match’s, and don’t forget that price tag on eHarmony’s sixer is a “special offer”! Wow. The twelve month subscription difference is right there as well, which is actually starting to shock me. What I assumed going into this quick research study was that eHarmony and Match pricing wouldn’t be too far off; after all they are probably each other’s biggest competition from a desktop/mobile traditional online dating site standpoint, but the disparity is insane. Alright, so with those two in the books let’s jump over to another Match property, OKCupid. 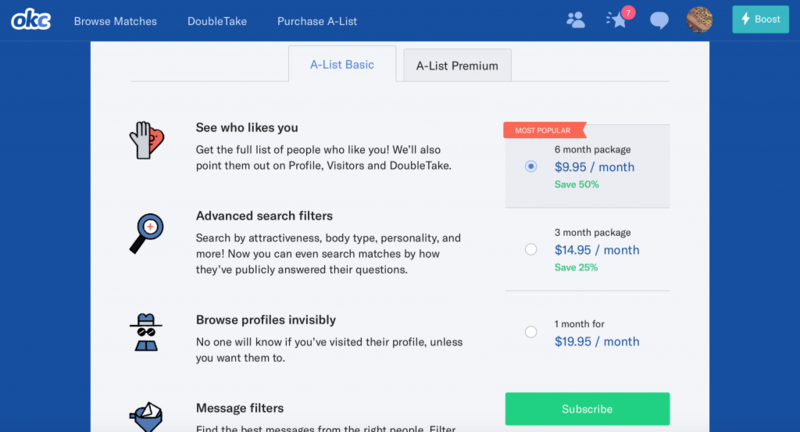 As you can see from the OKCupid price screenshot above, the first thing I noticed was that OKCupid has two different subscription pages/options for their “A-List”: Basic, and Premium. Interesting – let’s start with a quick review on the Basic plan; don’t worry though, this is a price guide that will cover all the angles – premium included. 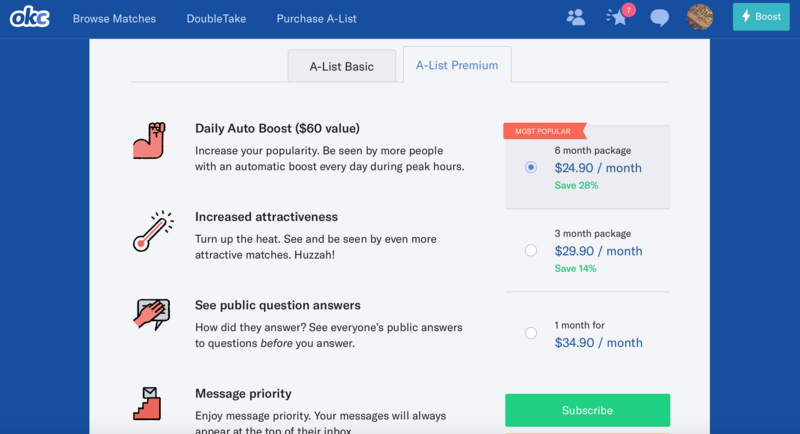 Alright, so first off OKCupid wins the award for providing the most sensible option by providing a one month subscription at their “Basic” tier, albeit it’s for $19.95. Moving up from there, pricing does go down on a monthly level as you subscribe for longer terms: up front costs then for OKCupid’s 3 month sub comes to $44.85, while their six month sub totals $59.70. Do we even need to compare to eHarmony and Match? Let’s check out their premium tab – my hunch is that we’ll start to see more big box type pricing. While the one month option is still present (kudos OKC! ), the price vaults up substantially to $34.90 for 30 days. 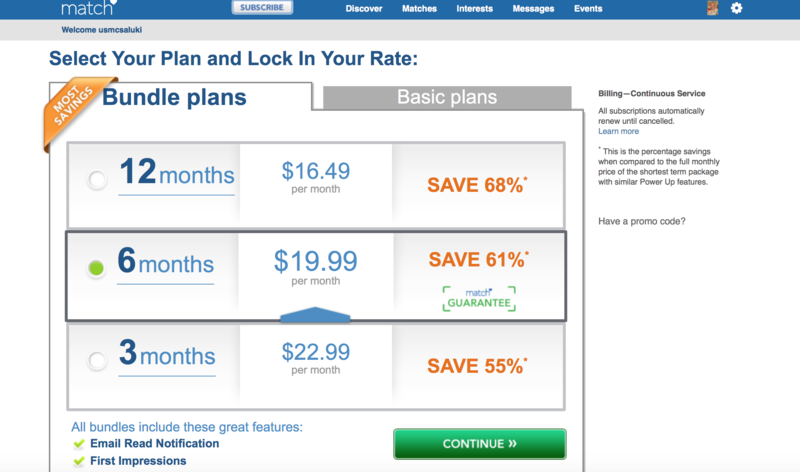 OKCupid’s 3 month up front cost comes out at $89.70, while their six month “premium” plan equates to an up front cost of $149.40. While you could easily compare OKC’s “basic” subscription tier to Match or eHarmony, you’re obviously getting limited functionality if you stick to the basics. But even when you use OKCupid’s premium tier as a comparison, OKCupid’s prices still come out on top. But of course, price isn’t everything: OKCupid is ginormous, but it isn’t the Match mothership. Regardless, it’s definitely interesting to compare. So now, let’s crack open the best for last – LFGdating. One month plan FTW: $5. Yes, you read that correctly. You’ll probably spend more on a sandwich at lunch, and you may even subscribe to handful of Twitch streamers each month. So why in the world would you shell out hundreds of dollars just to find love when there are more important things to spend money on? 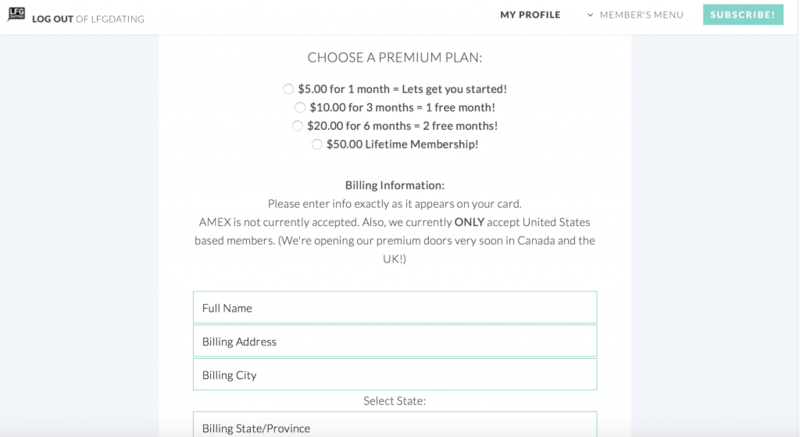 Perhaps our biggest plan, the Lifetime subscription, is a non-recurring, one-time payment of $50. Just like our one month option, we highly encourage you to do your own math on this one as that will only get you a single month at one of the big box online dating sites above. It’s mind boggling, isn’t it? So whether you want to go month to month or lifetime with LFGdating is up to you – both are awesome routes, and both would make George Constanza smile. But like I mentioned above, there are other excellent reasons we publish this 2017 price guide: transparency matters, and when you visually see just how expensive online dating has become it’s almost disturbing. Just like LFGdating has destroyed the “gamer dating” myth we aim to make online dating affordable for gamers, because what truly matters is finding love – another gamer, in fact – and not worrying about what else you have to cut out of your budget just to pay for a six month plan at one of the big box sites. So what are you waiting for? Create a profile today at LFGdating, and join the world’s #1 gamer dating site that has booths at major conventions, sponsors some amazing Twitch streamers, advertises like Mad Men (you see what I did there? ), and constantly listens to and improves the site and service based on our incredible members’ feedback. Oh, and did I mention we have an iOS app in the works? Click here to raise your LFG flag today!